While Needlepoint is the official name of this pattern, it is also known as "Embroidery." Needlepoint retailed for $4.95 in 1958. “New Pyrex Cinderella Serving Bowl. This lovely gift may be used as a soup tureen, casserole, punch bowl,” stated an advertisement from December 1958. 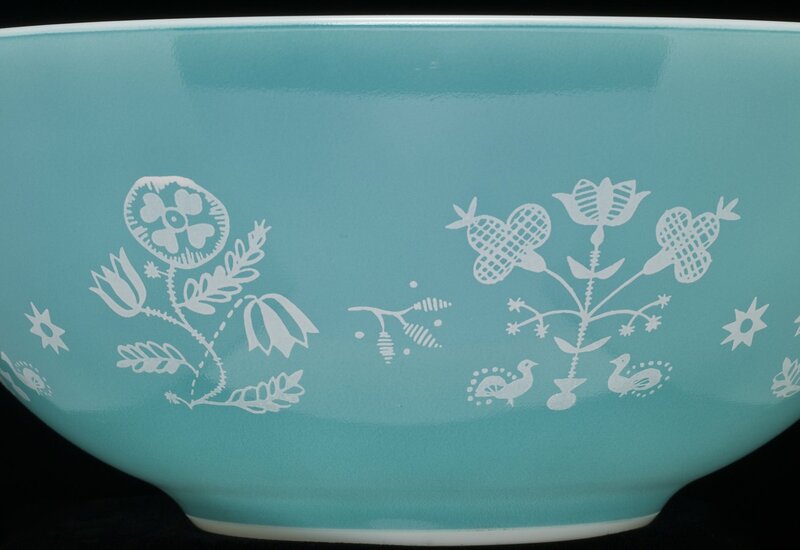 The light blue 443 Cinderella Bowl has whimsical designs of white flowers, leaves, stems, sprigs and turkeys that look as if they were stitched on to the side of the bowl. Officially named “Needlepoint,” this design is also referred to as “Embroidery,” and came with a serving cradle with candle-warmer and clear knobbed lid. The casserole and cradle retailed for $4.95 in 1958.